Tales from the Epitaph has been renamed to There Comes a Reckoning, and they're going to be offering a "TRUNK to help you house and organize your ENTIRE collection," and it comes with dividers (how many dividers is not specified). Sounds pretty handy! We can pledge for either the cards or the cards and the trunk. 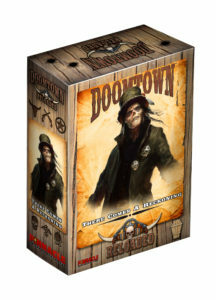 They're also including "a complete copy of the rules, updated to the latest edition, featuring the most recent FAQ, and lavishly illustrated with some of the best art Doomtown has to offer," and a "full-color sourcebook for Doomtown: Reloaded with background and stats for the most interesting rascals, varmints, and critters found in the game." I wonder what that is? I just really hope the trunk is sized for sleeved cards. That extra 5mm makes a big difference. I'll second that about the sleeves. I wonder how serious this trunk is. Like original premium set quality, or typical "large box" hold-a-bunch of cards quality. Sleeves have been taken into consideration - I personally attended to it. That said, the realities of manufacturing could come back to bite us. I just wanted to re-assure you that every measurement provided was for sleeved cards. Also - expect to see Gomorra come to life in the Deadlands RPG. The supplement will include stats for locations, monsters, dudes (good and bad) to use in your Deadlands: Reloaded campaign. @Alex, really glad to hear that my 2400 sleeved cards will have a good home (I have a problem). I am also really excited to see Gomorra (and its inhabitants) fleshed out in the supplement. When Doomtown got canceled I always thought about running a campaign to help extend the story (the posse shows up as Mario is burning down the Sheriff's office, go from there). Really excited to make an action deck of Doomtown cards and have the dudes/locations/items show up as they are drawn. @SavageJack - hope you still run that campaign (perhaps waiting for the official stats? ), despite the continuation. It sounds cool. I like the new name, it is dramatic and reminds me of classic Doomtown ("Ashes to Ashes", "The Mouth of Hell" and "A Reaping of Souls" to name a few) and chimes with the broader Deadlands world. Nice to see them talking about where this set comes in the timeline and their plans to move through the timeline with any future sets. Also pleased that @kollatt's excellent Ivor Hawley art is going to be on the front of the RPG book: it looks great on the promo Ivor Hawley Exp 2 but I look forward to seeing a non-cropped version at a larger scale. It might be a tight fit. Is it possible to get a stretch goal to prioritize the art budget for future sets (after There Comes a Reckoning)? Having beautiful art makes a big difference, and maybe folks might pay more for that. @Alex do you know how many dividers are included? Are they faction dividers only for the dudes, or are the actions, goods, spells, gadgets, and deeds also divided? So far, Dudes are the only thing that have multiple dividers. The rest are by suit.